This article is about Zelda's alter ego. For mouse character from Paper Mario, see Sheek. Sheik is the alter ego of Princess Zelda in The Legend of Zelda: Ocarina of Time, a major game in The Legend of Zelda series. Throughout the game, Sheik would appear unexpectedly and aid Link in his quest in defeating Ganondorf. Link (and the player) do not discover that Sheik is Zelda, until near the game's finale. Her appearance is very androgynous, and was made that way in order to make the reveal at the end more surprising. Because of this, she has been referred to as both male and female by other characters as well as in certain descriptions, but is canonically female. She serves as a playable fighter in the Super Smash Bros. series, starting with Super Smash Bros. Melee. In the first two games, using the Transform move, Zelda could become Sheik mid-battle, but in the Nintendo 3DS and Wii U games and Super Smash Bros. Ultimate, Sheik is a separate character. Appears onto the stage, as if Zelda had just transformed into Sheik. In Super Smash Bros. Melee, Zelda is able to use her down special move Transform to turn herself into Sheik at any point, or automatically at the start of a match by holding down A on the stage select screen, giving her a completely different moveset and playstyle. Compared to Zelda, Sheik is more agile, with quick movements and attacks, but she lacks Zelda's power. The lone exception is her up smash, which has a sweetspot that can hit twice for about 30%. 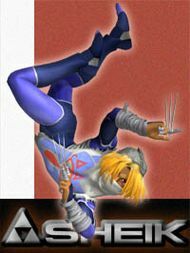 Sheik's standard special move is Needle Storm, in which she gathers and tosses needles at opponents. Her side special move is Chain, in which she tosses a chain that can grab opponents. Her up special move is Vanish, in which, similar to Zelda's Farore's Wind, Sheik disappears in an explosion and reappears in a different location depending on the direction held. Finally, her down special move is Transform, which turns her back into Zelda. According to the Star Rod's trophy information, it has most power when Sheik or Captain Falcon perform a smash attack with it. 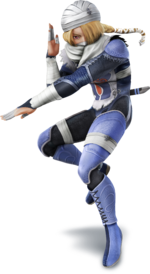 Unlike the other The Legend of Zelda characters, Sheik can actually speak, though this is exclusive to the Japanese version of Super Smash Bros. Melee. Sheik returns in Super Smash Bros. Brawl, with the same role as before. Matching with Zelda's design, Sheik's design in this game is based upon unused concept artwork for The Legend of Zelda: Twilight Princess. In this game, Sheik can now be chosen from the character select screen, by choosing Zelda and selecting Sheik's portrait. Sheik is voiced by Jun Mizusawa, who also did the voice of her counterpart, Zelda. Sheik retains weak attacks and a powerful up smash, but her down smash can now hit twice, allowing for 23% damage. Sheik can now wall jump and crawl; additionally, her Chain move can be used as a tether recovery. In addition, she shares her Final Smash with Zelda, Light Arrow, though Sheik's Light Arrow deals greater damage and knocks back at a more horizontal angle than Zelda's. At any point in The Subspace Emissary at which the player can control Zelda, they can transform into Sheik using the Transform move, and vice versa. However, Sheik is not properly introduced until later in the story. After being turned into trophies and kidnapped, Peach and Zelda are being held in cages in the Halberd, until they are freed by Meta Knight, Lucario, and Snake. Snake tells them to stay where they are, but Zelda transforms into Shiek and sneaks out of the room with Peach, moving around the outside of the Halberd until they reach the main deck. While Fox is battling the Halberd in his Arwing, he almost blasts Peach, prompting Sheik to appear on top of his Arwing and attack him. Both of them leap down onto the bridge and start to fight, but Peach stops them by offering them both tea. While this is happening, Snake punches the Mr. Game & Watch copies onto the deck from the bridge, the Shadow Bugs forming together into Duon. Sheik, Fox, and Peach, along with Snake, Lucario, and Falco, fight Duon, and after it is defeated the Trophy of the actual Mr. Game & Watch appears, which Peach returns to normal. After this point, the rest of The Subspace Emissary's storyline features Zelda. 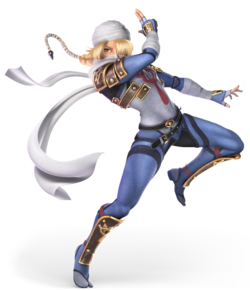 Sheik is now a separate character from Zelda in Super Smash Bros. for Nintendo 3DS and Super Smash Bros. for Wii U. This means she and Zelda can no longer transform between each other. Instead of transforming, her down special move is now a move called Bouncing Fish, in which she leaps with a backflip and strikes with the heel of her foot. In addition, her side special has been changed to Burst Grenade, in which she tosses a small grenade attached to a string that explodes after a certain time. Sheik returns in Super Smash Bros. Ultimate this time as an unlockable playable character. She has a new Final Smash, Sheikah Dance, in which she stuns any opponents in front of her (as the Sheikah symbol briefly appears) and deals multiple slashes with her knife while constantly vanishing and reappearing around them, culminating with a final blow that launches them away. Her outfit in this game resembles the Stealth Chest Guard and Stealth Tights from The Legend of Zelda: Breath of the Wild. Needle Storm is Sheik's standard special move. Sheik gathers up to six needles, which can be thrown at any point by pressing. In Super Smash Bros. Melee and Super Smash Bros. Brawl, Sheik charges by holding down the special move button and throws by releasing it, but in Super Smash Bros. for Nintendo 3DS / Wii U, Sheik charges by simply pressing the button, and can attack by pressing again. Like most charging special moves, Sheik can stop charging by shielding or rolling. In Super Smash Bros. for Nintendo 3DS / Wii U, Needle Storm has two custom variants that can be unlocked: Penetrating Needles and Paralyzing Needle (Paralysing Needle in the PAL version). Penetrating Needles throws only three needles, but they are able to go through opponents and deal electric damage, while Paralyzing Needle throws a single needle that cannot be charged, takes longer to throw, and deals less damage but is able to stun opponents that are hit. Chain is Sheik's side special move in Super Smash Bros. Melee and Super Smash Bros. Brawl. When used, Sheik throws a chain out in front of herself; the player can control the direction the chain is thrown using the control stick. If the chain hits at the tip, it deals electric damage. In Brawl, Chain can also be used as a tether recovery. Burst Grenade is Sheik's side special move in Super Smash Bros. for Nintendo 3DS / Wii U, replacing her Chain move from Super Smash Bros. Brawl. When used, Sheik pulls out her chain, which has a small grenade on the end of it. After a short amount of time, the grenade will transform into a small vortex that can pull in nearby opponents, then a explosion will occur. Two custom variants can be unlocked in both games: the Gravity Grenade, which doesn't transform into a vortex but knocks any opponents caught in the explosion towards Sheik, and the Skimming Grenade, which bounces along the ground and explodes faster than the Burst Grenade. Vanish is Sheik's up special move. Functioning similar to Zelda's Farore's Wind, Sheik throws a Deku Nut onto the ground and vanishes, reappearing in a location dependent on the direction the player holds on the control stick. If used in the air, Sheik leaps up a little before vanishing. In Super Smash Bros. for Nintendo 3DS / Wii U, the Deku Nut explosion and Sheik's reappearance now damage opponents. Super Smash Bros. for Nintendo 3DS / Wii U also gives this move two custom variants. 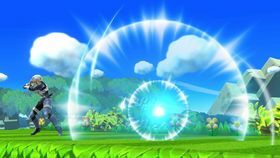 The first variant is Gale (originally named Instant Warp), which increases the speed of the warp but removes the explosion, meaning that the move cannot damage. The second is Abyss, which is slower but any opponents hit are knocked into the air and meteor smashed. Transform is the down special move of both Zelda and Sheik in Super Smash Bros. Melee and Super Smash Bros. Brawl. Using the move transforms Sheik into Zelda, and vice versa. In Melee, the transformation is faster as both characters are loaded at all times; in Brawl, however, the transformation is longer since the game needs to load the other character separately mid-battle. During the transformation, the "puzzle solved" tune from The Legend of Zelda can be heard. Taking damage while the move is in progress immediately cancels the transformation. 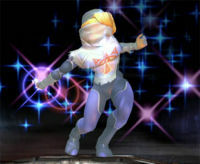 Bouncing Fish is Sheik's down special move in Super Smash Bros. for Nintendo 3DS / Wii U and Super Smash Bros. 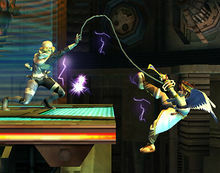 Ultimate, replacing her Transform move from Super Smash Bros. Brawl due to the elimination of in-battle transformation moves. It is visually similar to Zero Suit Samus's Flip Jump special move, as it involves Sheik leaping forward with a kick. If the kick lands, the opponent receives high knockback, and Sheik rebounds backwards in a higher arc than the original. 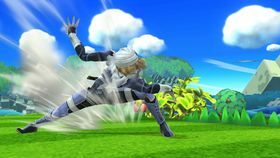 If the player presses the special move button again after the first kick lands, Sheik can perform a second kick. In Super Smash Bros. for Nintendo 3DS / Wii U, the first custom variant, Jellyfish, covers much more height and is slightly slower than Bouncing Fish, and also knocks the opponent in the air, allowing Sheik to easily kick a second time. The second custom variant, Pisces, moves fast and covers the most distance, although the kick is optional when performed on the ground. Light Arrow is both Zelda and Sheik's Final Smash in Super Smash Bros. Brawl and Super Smash Bros. for Nintendo 3DS / Wii U. When used, Sheik pulls out a bow and arrow, based on Zelda's Bow from The Legend of Zelda: Twilight Princess, and strings the arrow back. The arrow is then fired in a stage-wide straight line, damaging and launching opponents caught in the line of fire. Like Zelda's Light Arrow, Sheik's can fire through opponents' shields as well as any walls and obstacles, and opponents that are closer to her receive more damage and greater knockback than those further away. Additionally, while Zelda's Light Arrow sends opponents flying upward, Sheik's Light Arrow sends them at a more horizontal angle. In Super Mario Maker, one of the 8-bit costumes Mario can receive from a Mystery Mushroom is Sheik, which can be unlocked either with a Sheik amiibo or by clearing 100 Mario Challenge on Normal difficulty. All of Sheik's sounds are from The Legend of Zelda: Ocarina of Time. The costume's transformation sound is the sound clip that plays when collecting an important item. Pressing will have her turn into Zelda (using her sprite in this game based on The Legend of Zelda: Twilight Princess), which briefly plays "Zelda's Lullaby" as it would sound on Link's ocarina. The sound that plays when she jumps is her voice clip when throwing a Deku Nut before disappearing. The death tune is Sheik's theme, and when clearing a level, the theme in which Link initially meets Zelda plays. N64 The Legend of Zelda: Ocarina of Time The persona Zelda adopted to escape from Ganondorf. She completely hid all traces of her Zelda identity and appeared to Link as the last member of the Sheikah tribe. She taught Link essential ocarina melodies and then vanished in an instant. She didn't appear very often--rather, she would show up to support Link in crucial situations. Wii Super Smash Bros. Brawl Sheik's Final Smash. After grabbing a Smash Ball, Sheik will be able to wield a bow of light. The arrow fired from this bow has the power to pass through multiple targets, so it will damage all enemies in the direction it flies. This, coupled with its shield-breaking power, makes it even more terrible. Even in Sheik form, Zelda's ability as an archer is undiminished. Snake: What's going on here? What happened to Zelda?! Mei Ling: Snake, Princess Zelda transformed into Sheik. I can understand the clothes, but to change her skin and eye color? That must take some powerful magic. Mei Ling: Come on, Snake! Don't get all grumpy and start talking about how unscientific it is. Science is basically just another form of magic that makes our lives easier. Snake: I never thought I'd hear that coming from you, Mei Ling. Mei Ling: Don't you think talking to someone halfway around the world is a kind of magic? Or flying across entire continents? Snake: No, I think this is completely different. 3DS The Legend of Zelda: Ocarina of Time 3D (6/2011) NA: In The Legend of Zelda: Ocarina of Time, Sheik claimed to be a surviving Sheikah. However, this was just a cunning disguise for Princess Zelda so that she could escape Ganondorf. In Smash Bros., she's the complete opposite of Zelda, striking with fast attacks that can keep an opponent off balance. PAL: Sheik is introduced in The Legend of Zelda: Ocarina of Time as the "survivor of the Sheikah", although it turns out to be Zelda, who took on the disguise to hide from Ganondorf. Sheik's ninja-like speed is a real contrast with Zelda's, and it allows for sneaky, fast-paced attacks that overwhelm opponents before they can even react. (Wii U) NA: In The Legend of Zelda: Ocarina of Time, Sheik claimed to be a surviving Sheikah. However, this was just a cunning disguise used by–SPOILER ALERT!–Princess Zelda so she could hide from Ganondorf. In Smash Bros., she's the complete opposite of Zelda, striking with fast attacks that can unbalance her foes. 3DS The Legend of Zelda: Ocarina of Time 3D (6/2011) NA: Sheik's Burst Grenade side special throws a small grenade that draws in nearby fighters before exploding. Once the button has been released, it'll hop or explode after a time. The down special Bouncing Fish is an attack where Sheik strikes with both heels, falling similarly to the way a fish might flop around. PAL: Sheik's Burst Grenade side special throws a small grenade that draws in nearby fighters, then explodes. Hold the button longer to thrown it further. The down special Bouncing Fish is a fish-like flop forwards that has Sheik attack with both heels on the way down. 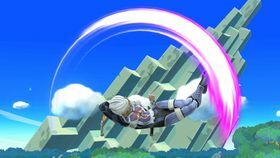 If the move connects, Sheik will bounce back up into the air. NA: Sheik's Final Smash uses a gigantic bow to fire a Light Arrow across the screen. If multiple foes are in its path, it will strike them all, ignoring shields like they're not even here. Sheik's Light Arrow is more damaging than Zelda's, and it launches its victims at a lower angle. PAL: Sheik's Final Smash uses a gigantic bow to fire a Light Arrow across the screen. If multiple foes are in its path, it will strike them all, even penetrating straight through their shields. Sheik's Light Arrow is more powerful than Zelda's and it launches its targets at a more shallow angle. Pit: I wish I knew Sheik's true identity. Palutena: It is one of the great mysteries of our time. Viridi: Are you guys for real? You can't be serious. Palutena: Compared to the other fighters, Sheik moves very quickly. Don't get overwhelmed by Sheik's speed, especially one-on-one. Sheik is a mysterious, masked warrior who played an important role in Link’s quest in The Legend of Zelda: Ocarina of Time game. Disguised as part of the Sheikah tribe that populates Hyrule, Sheik taught Link essential ocarina melodies and then vanished in an instant. Why does Sheik look so familiar? Palutena: Sheik appears to be wearing a traditional Sheikah outfit this time around. Pit: I always get nervous when Sheik gets close. If I make one wrong move, I'll get pummeled with a flurry of quick attacks! Palutena: His attacks may be fast, but they aren't very strong. That's why he'll try to end the fight quickly. He's also very light, so focus on launching Sheik at lower damage percentages. Viridi: And he doesn't have much reach, so keep your distance until you're ready to rush him with your Upperdash Arm. Pit: Good advice! But...you guys do know Sheik is just Zelda, right? In disguise? Wait, is there a new timeline?! Sheik's name can be seen in the Nintendo 64 and Game Boy Color versions of Mario Golf on the game scoreboard in Tournament mode. Sheik never gets turned into a trophy in the main story of the Subspace Emissary. Likewise, Zero Suit Samus, Squirtle, and Sonic never get turned into trophies either. In Super Smash Bros. Melee, Sheik ends up sending opponents flying vertically with the Home-Run Bat. Therefore, she needs to transform into Zelda to use the Home-Run Bat properly in the Home-Run Contest. This page was last edited on April 2, 2019, at 18:07.